May has finally arrived, and our community of apartments for rent in Pearland is filled with families prepping for summer. With summer comes summer break, when the kids are home from school and demanding your attention at all hours of the day. One way to get them to calm down is to feed them, but coming up with new meals each day can be an exhausting endeavor. For that reason, many parents resort to feeding their kids some very basic meals. Grilled cheese, mac & cheese and peanut butter sandwiches are all easy to make, easy to eat, and leave little to no clean-up for mom or dad. However, those are also fairly boring meals. If you want to give your kids —or yourself—a real treat next time you sit down for a meal, we have a couple ideas. With some help from the good folks at Thrillist, we put together a post describing various ways to add flavor to some basic foods. There’s always room for improvement in the kitchen, whether you’re making these common dishes for yourself or your kids. Without further delay, here is the latest post from your favorite community of apartments in Pearland. The first rule of cooking a grilled cheese sandwich is this: Keep it open! Place both pieces of bread on the pan with the cheese on top of each piece. Not only will this cook the sandwich more evenly, it will also cook it faster and allow you to add additional ingredients while it cooks. Before you can even think about putting the bread on the pan though, you have to ensure your crust will be crispy. The best way to do this is not by spreading butter on the outside of the crust. In fact, mayo is the spread of choice here. Put some mayo on the outside, throw some cheese on the inside, and place the two pieces of bread on the pan with the mayo side down. 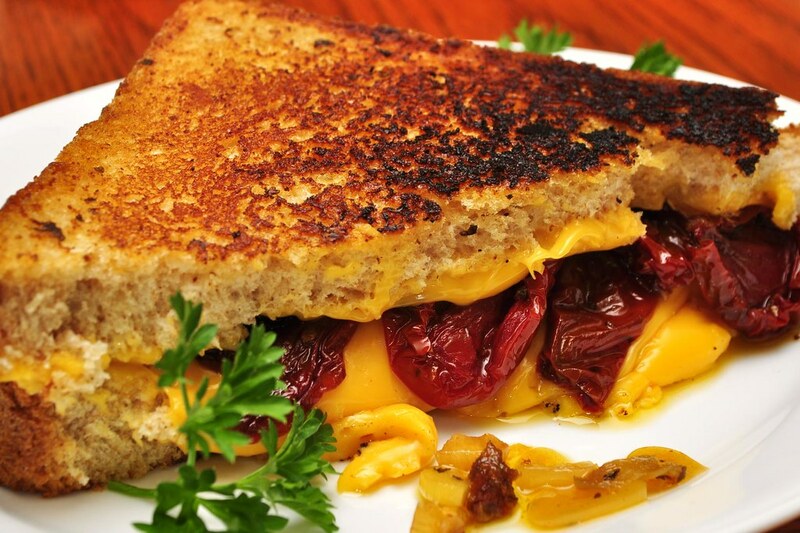 Follow this advice for your next grilled cheese sandwich, and thank us later. Next time you go the grocery store, pick up a carton of heavy whipping cream. From now on, forget about using milk in your mac & cheese. Do you ever wonder why mac & cheese at restaurants is so much better than the stuff you make at home? Besides the flavoring and spices, restaurants often replace milk with heavy whipping cream when mixing up their mac & cheese. This makes the dish extra thicker, creamier, and overall better. So you’ve instantly improved your mac & cheese by replacing milk with heavy whipping cream, but now you want to take things to the next level. Enter, ranch dressing. Toss a spoonful of ranch into your pot next time you whip up some mac & cheese to add an extra layer of unexpected flavor to every bite. Finally, we come to the most basic of basic meals. Even a raccoon could potentially make a peanut butter and jelly sandwich. However, you are a human, and soon you will know how to make a next-level peanut butter and jelly sandwich. You probably know that toasting your bread makes the sandwich extra crunchy and thus, extra tasty. Do you also know that adding fruit to your PB&J brings out the flavors of the jelly? Try throwing a couple raspberries or sliced strawberries into your next PB&J. The effects are extraordinary. Another option to spruce up your PB&J is adding bacon. This might sound crazy, but bacon actually goes well with almost everything. The savory flavors in bacon will compliment the sweetness of the sandwich. Hey, sometimes you have to be daring. Thanks for reading the latest blog from Stella at Shadow Creek Ranch. We’ll be back soon with more tips and tricks for living your best life. In the meantime, follow us on social media and stay up to date with the affordable luxury apartments in South Houston.